Hello everyone how are you all doing? It’s being a while I wrote on the blog, do forgive me. 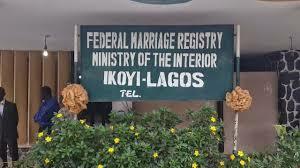 So today I went to the famous Ikoyi Registry, yes oh the very famous Ikoyi marriage registry. I had been looking forward to the day I’ll visit that tourist site (hehe hehe) and today I was able to; I went with a friend; a photographer who went to cover a client’s wedding. You know how everywhere on social media, you see that famous background, Ikoyi marriage registry; like it’s the ultimate evidence that you’re now married. Before I begin my ikoyi registry jist; let me first describe the little part of ikoyi I saw. At first, when I entered Lagos island, I was like is this the “Lagos Island” I have always heard about? It wasn’t “tushed”, lol or looked like an expensive place, it looked kinda dirty (forgive me oh Lagosians). I expressed my disappointment to my friend, who kept telling me; wait till you get to Ikoyi first. When we now got to Ikoyi It was then I was wowed, I saw beautiful houses, clean streets, I was beginning to see the “tushed expensive” places I always see on social media. Like I told my friend, I have gone to the whole of Lagos on social media (LMAO). I even went to the famous Awolowo Road Ikoyi and saw a lot of these designer stores; in my mind, I was shopping (window shopping, hehe hehe). Enough of my preamble; today was such an interesting day. I saw a lot of things. I have to say this, I love Lagos people; I just love their business sense. To get a chair to seat at the registry, you have to pay for it; I believe (hundred naira) N100, even the common things you buy cheaply in other places, has special prices within the registry compound. There were so many people; it was overwhelming. I saw a bus load of people (family members) of a particular couple and I was asking myself why all these people just for a few minutes ceremony. Different couples in different shapes and sizes, different attires; some very funny, you could ask yourself what they were thinking, some outrageous. Some brides were even having their makeup done right there, someone even bought a wedding dress there (I think). It was interesting watching a lot of people. With the crowd, I saw at ikoyi registry today eh, I couldn’t help but wonder out loud the number of people getting married in Lagos/Nigeria every day. My friend then said not less than two hundred couple get married at the ikoyi registry everyday asides Sunday. Meanwhile, yours truly was very hungry, I walked to a shop to get biscuits, and a biscuit that normally sells for N250, was selling for N500, but I really wanted it so I got it. Despite the fact that, it was expensive I wasn’t sorry for buying it. One just has to respect the business hustle of Lagosians, I love and respect that a lot. I missed out one important fact, I and the friend that went together live at different places, we had already agreed to meet at a particular place. Anyway, because I arrived late at our agreed meeting place; we were running late for the event. We had to take uber, and I couldn’t believe the amount we paid. It was shockingly very expensive. Luckily, we weren’t late for the event after all; we even had to wait for hours before the event kicked off. Anyway back to my original jist, we were informed that the event would commence at 9:30am, when 9:30 came, we all crowded at the entrance; awaiting when they would commence. As my friend’s client was number 1. Apparently, at the registry, couples pick numbers, and they are attended to according to the number picked. I was at the entrance of the registry when a gorgeously dressed elderly woman walked towards where I stood. An elderly man who had been sitting beside me stood up for her, he apparently had kept the seat for the woman. As she approached, two (2) people walked with her; who I perceived to be her children. They clearly dotted on her and attended to her. I was carried away by this woman, she was really beautiful, had makeup on, and was dressed to the nines, so I was just staring. For crying out loud, here was an old woman who clearly had things to teach younger women about beauty. She and her kids looked like real money bags and were speaking “oyinbo” English, so basically I was watching them like a movie. Hey, don’t judge me the day was getting boring so anything to feed my eyes with would be welcomed. I didn’t even know when it happened, didn’t even know when he walked up to where I was, all I heard was a cry, a stifled cry, I turned but not completely (so I wouldn’t be caught) then I saw him, a well-built man, well suited up; in a blue suit and a red tie, not too handsome, but not bad looking, who seemed to be in his thirties, crying. He was hugging his mum (the gorgeously dressed elderly woman), telling her he loved her and burst into tears. Honestly speaking I wanted to laugh, here was a man who’s old enough to be a father of three, crying and sobbing like a child. He was the one getting married, yet he was crying like he was going into a prison yard leaving his mum. I quickly called my friend’s attention to this drama and we couldn’t help but laugh. He’s a classic case of a mummy’s boy, who wasn’t ready to be cut off from mummy’s strings. I told my friend, he’s wife must be ready and very strong, because marrying a mummy’s boy is a lot of work especially a first class one like that(forgive me oh). Anyway my friend’s client started the show, and I was really happy to have witnessed the joining process. The officer in charge was speaking so fast; he was reciting his words like a well-rehearsed verse. Standing there at the registry today, I couldn’t help but think and imagine my own day. If I get to stay in Lagos, I would definitely marry at that registry. In my imagination, I was imagining the type of dress I would wear, my makeup, my hair, people who would come etc. Don’t mind me jor, Lagos has a way of making you want a relationship. All my time in Abuja, I don’t even feel that I’m single; maybe it’s because I don’t go anywhere. But here in Lagos, everywhere I go, you see people in twos (lol); a man and a woman. It is well; I know my time would come. Till then let me just keep dreaming. Thank you for reading, your thoughts in the form of comments would be highly appreciated. Story teller!! Me I love a man that isn't afraid to show emotions o, its just nice. There might be another reason he was crying. Anyway you are funny, see how you said you finally got to visit the tourist site. HAHAHAHAHA, NA REALLY TOURIST SITE.